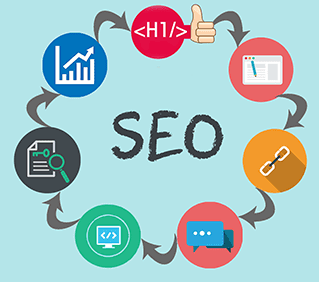 SEO, as you might have already know, is an acronym for search engine optimization. In the simplest of words, it's the way search engines like Google.com, Yahoo.com, Bing.com and others present your page in users' search results on their sites. Cool, how do they that? Well, they do that via sophisticated software tools, called spiders. Consider the whole internet as an empty room, with air particles as websites. Now sneak a spider into that room. Each tiny step that this spider would take now is essentially crawling a website (as the room is dark and full of websites). This is how search engines crawl through the web picking up site after site, studying them and ranking them. This ranking is important, really important. A higher ranked website by Google will always be on the first page of Google's search results for a related query compared to a lower ranked one. So, in order to get ranked higher, you and I need SEO. SEO is like black pepper without which fried egg might not taste 'that' tastier. In simple words, in order for search engines to find your site and rank it higher than others in your field, you need to optimize it. Let's see how with these 7 simple tips. Refers to optimization of your actual web content including your HTML code, your text, as well as graphic content. Off-page optimization, however, deals with things like backlinks (hyperlinks pointing to you site from other websites, apps and networks). Post titles are important for SEO. They really are since they are deal makers or breakers. Whenever you write something, make sure you give proper attention to the post's title. Make your titles simple, intriguing, descriptive and gullible so that people may know what is this all about and what to expect. An even better approach is to wear searchers shoes while giving a title and think how would you Google it if you were looking for content like this. Also, don't forget to include keywords in your title and keep it under 70 characters (or search engines would crop it before looking). If you think 'content' isn't important for SEO, think again! Your content is the most important part of your site. While writing, don't copy-paste from elsewhere, don't stuff it with keywords alone, don't bombard it with images and multimedia files and don't write any lesser than 300 words. These all would affect your ratings quite poorly. So, write original, use keywords in scenarios instead of straying them around (like I didn't use SEO here, SEO there in every next line), use images where they suffice and make sure you name them properly to appear in image search results, i.e. an image with the "img009.jpg" name would never appear in the image search results but "tips_to_success.jpg" would. The best would be to use text content and wrap them proper in HTML tags like <H2></H2> etc. (search engines likes content this way). Also, make sure your blog post's length is somewhere between 300-500 words - crossing over is fine but lesser isn't. Keywords are terms that others may use to search for your content. While keywords are important for SEO, don't go on and stuff your site with keywords. This would make your content appear like a spam to spiders, who would neglect it henceforth. Ideal is that once you have chosen your title (and included your keyword in it, as I have added keyword SEO in title above), use it in page URL, in your starting and ending paragraphs, as well as in article body where required without sounding awkward. Additionally, you may link it using anchor text to relevant resources in and out of site. If we had been living in early part of 21st century, meta tags might have done all the SEO for your site. Unluckily, we aren't. Google and other search engines have long left using meta-tags for finding site information. Hence, if someone tells you meta-tagging is all you need for your sites SEO, tell them it isn't. Nevertheless, it's important that you use your keywords in your meta-data. Some themes already do that for you, if they don't (you can check that using page source or using view source code from browser), don't sweat. You can use 3rd party plugins like All in One SEO Pack and Scribe. Make others talk about your site and share your content on social media sites or their blogs. It gets even better if somehow sites with high ratings link back to your site. This makes spiders think that you are someone important that everyone these days is talking about, resulting in enhancing your ratings dramatically. Guest posting is another good approach for that. Comment on other sites, make friends with bloggers (best in business) and make them comment at yours. These tiny little things do matter a lot, resulting in enhanced SEO of your site. Link out to other sites, networks and posts, or even to your previous posts (also called inbound or backlinks) using anchor element with keyword. Or even better, make others to link in to you, via sharing your content on their sites or social media networks. As stated above, an even outstanding strategy for building links is guest posting. Sites with new content every day, or twice thrice a week have still far better ratings than those who post every fortnight. A better incoming content frequency makes spider come to your site regularly, resulting in better ratings and enhanced SEO. Are we done then? Well, trust me - your sites rating is in your hands, not in Google or Yahoo. SEO is just about doing things neatly and in a sophisticated manner. Walk your site these 7 steps for a quality SEO and you will witness the difference yourself at Google, if no place else. Remember, code clean, write original, socialize... this is what SEO is all about!